I’m driving into North Wales to visit a friend and take part in an art workshop tomorrow. Between Corwen and Betws y Coed the A5 crosses high, open land to give this broad view of the high summits of the heart of Eryri, Snowdonia in English. On most of my previous journeys this way the air has been a bit hazy, but this evening it’s dry and warm and clear, increasing the apparent scale of the mountains. Yr Wyddfa (Snowdon) translates roughly as “the eminence” in most descriptions. 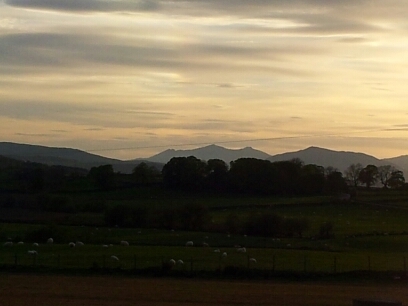 This evening it does appear to stand slightly apart from its neighbours, the Glyderau and Tryfan. Moel Siabod, closer and darker, marks my destination, a solid stone farmhouse near its flanks. My friends are waiting, we shall be exchanging news, and beer. The sun is sinking, time to go.